In my review of the news reader I’d set up to track the legit resources for Star Wars news, I stumbled across a reference to a Reddit Ask Me Anything (AMA) with David Kamp, the writer of The Last Jedi cover story for Vanity Fair. And in the AMA, he answered questions that relate to not only TLJ, but also to Episode IX and the Star Wars standalone movie anticipated for 2020. I’m going over all the details from the de-facto cutting room floor of Kamp’s article in today’s podcast! Hope you enjoy it, please subscribe if you don’t already, and please consider becoming a Patron of the show as well! Today’s question: What’s the first line of dialogue spoken in Rogue One, and by whom? 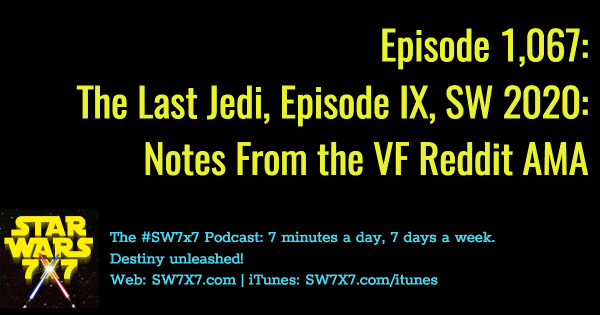 Next Post: Episode 1,068: What’s Kylo Ren’s Biggest Challenge in The Last Jedi?